THEY improv helps teach presentation skills to companies helping them to think outside the box and to get outside perspective on issues that directly effect the bottom line. We can consult with your group and listen to your needs. We come at it with a mind's eye of finding the best approach for your group to better achieve your goals. Nothing in a corporate environment is more important than presentation skills. Without the ability to properly represent your company or to relate the invaluable information that you wish to make available, you lack the ability to assist in the growth and profitability of your organization. THEY improv can assist you to gain the corporate presentation skills that will allow you to put your company in its most favorable light. Whether in a sales meeting, investor conference or one-on-one, corporate presentation skills training will help you make the most out of any given situation. With a combination of training exercises, practical applications and improvised scenarios, THEY improv will walk you through the process of enhancing your ability to relate to those around you. This is not a comedy class, it is training for corporate presentations. Regardless of current skills, THEY improv tailors the workshop to assist in the areas that most require help. Likewise, THEY improv will use real-world scenarios from your own industry to assist you in a most practical manner possible. Improvisation is a great way to learn skills that are useful in every aspect of life. Have an important presentation coming up? 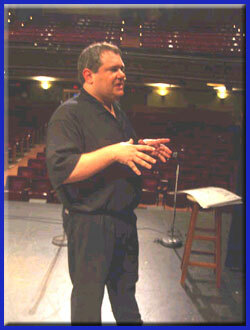 In addition to the general corporate presentation skills training, THEY improv help you with a specific presentation. From bolstering your MicroSoft Powerpoint presentation, to coaching on specific interaction with the visual presentation while speaking. 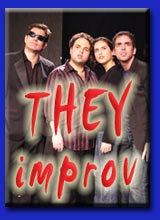 Let THEY improv analyze and critique your presentation and assist you to improve. What is nailing a major presentation worth to you? Find out how THEY improv can help you succeed. THEY are Improv-ing Business! Email us at info@THEYimprov.com or call the Director of THEY improv, Todd Rice for THEY improv business consulting (866) 219-4386. THEY improv can provide these workshops in South Florida, Tampa, New England (Boston and elsewhere), Upstate New York, Atlanta, Chicago, Milwaukee and Southern California (from Los Angeles). Likewise, our professionals can travel for an additional fee to other parts of the country or internationally.